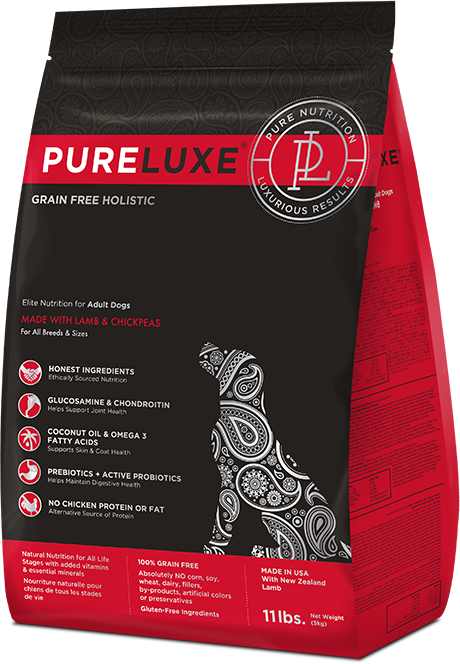 Our Elite Adult Lamb Dog formula is for adult dogs that have food sensitivities to specific proteins or glutens. This formula has absolutely no chicken products. It is a true Hypo-allergenic formula for those dogs who do well on a lamb based diet, but who cannot intake chicken, beef, wheat, soy, or corn. # 1 Ingredient is Fresh Lamb, Naturally Occurring Glucosamine & Chondroitin, Hi Percentage of Omega 3 Fatty acids, Active Probiotics + Prebiotics, and Ethics. Deboned lamb, lamb meal, dried chickpeas, dried lentils, dried green peas, dried yellow peas, pea protein, canola oil (preserved with mixed tocopherols), natural flavor, flaxseed, tomato pomace, coconut oil, dried kelp, salt, dried chicory root, vitamins (vitamin E supplement, niacin supplement, D-calcium pantothenate, vitamin A acetate, thiamine mononitrate, pyridoxine hydrochloride, riboflavin supplement, vitamin D3 supplement, biotin, vitamin B12 supplement, folic acid), dried apples, dried carrots, pumpkin seeds, yucca schidigera extract, dried cranberry, minerals (ferrous sulfate, zinc oxide, calcium carbonate, manganous oxide, copper sulfate, iron amino acid chelate, manganese amino acid chelate, zinc amino acid chelate, copper amino acid chelate, sodium selenite, cobalt carbonate, ethylenediamine dihydriodide), dried algae meal, taurine, mixed tocopherols, choline chloride, l-carnitine, turmeric, dried Aspergillus oryzae fermentation extract, dried Trichoderma reesei fermentation extract, dried Aspergillus niger fermentation product, dried Candida rugosa fermentation extract, dried papaya, dried pineapple, dried Enterococcus faecium fermentation product, dried Lactobacillus acidophilus fermentation product and dried Lactobacillus casei fermentation product, rosemary extract. 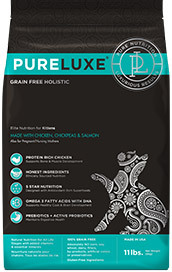 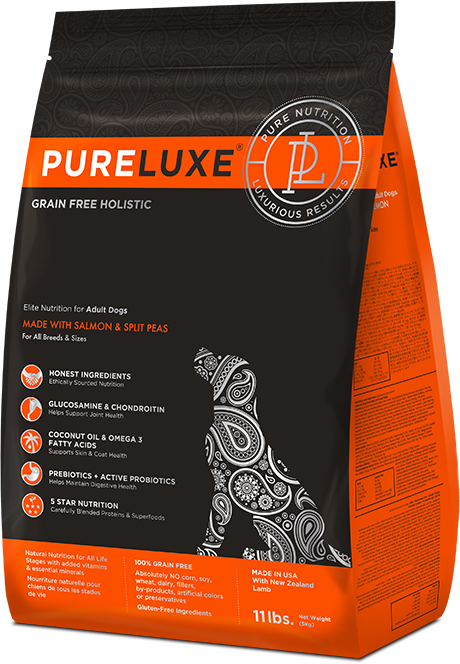 *Contains a source of live, naturally occurring microorganisms.PureLUXE Adult Dog Food is formulated to meet the nutrient levels established by the AAFCO Dog Food Nutrient Profiles for all life stages. 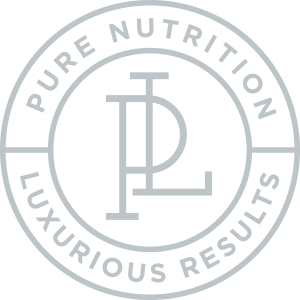 Transition to Pureluxe over a period of one week. 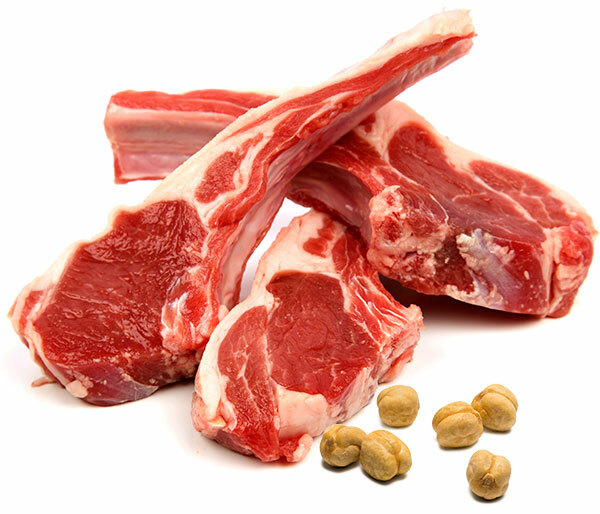 Always provide fresh water. Protect from moisture. 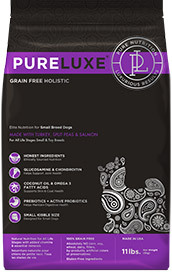 Store in a cool, dry place in closed bag or container. Each dog is different, so optimal feeding amounts vary with age, size, activity level, breed or environment. 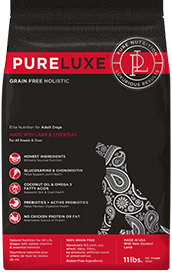 Puppies/Pregnant/Nursing Mothers may require up 2-3 times more food than an Adult. 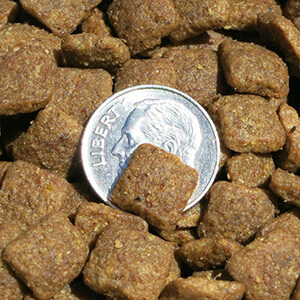 Divide total recommended feeding amount per day into number of times you feed your dog. 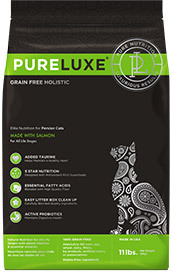 If feeding with wet food, reduce dry amount fed by 1/8cup for every 2 Tbsp of wet food. If loose stools occur, first try to reduce quantity fed to dog and/or avoid feeding other foods until stool becomes firm.